Tingling sensations anywhere on your feet after a run can have many causes, some more serious than others. Knowing when to pursue professional medical attention and when to simply buy new shoes comes from a knowledge of what is at the root of the tingling. For chronic tingling, consult your doctor, who will examine your feet and running habits to identify the cause of this uncomfortable problem. 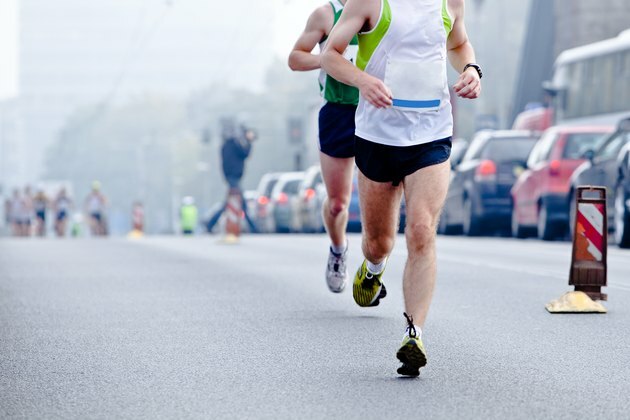 The persistent pounding that your feet endure while running may cause compression syndrome. Compression syndrome occurs when the pressure in your lower leg increases quickly, resulting in tingling that travels down your lower leg toward your foot and lasts for hours after running. Dr. Paul D. Thompson, a professor of medicine at the University of Connecticut Health Center, says this condition can improve as a person becomes more fit, but not always. Try wearing thicker socks that add compression while you run to reduce the swelling. For immediate pain relief, ice your feet and shins for 10 to 15 minutes after a run. If your pain persists, a doctor may consider surgery for a more permanent treatment option. Numbness and tingling on the top of your foot can be an indication of a stress fracture. These types of fractures incur pain at a particular site, and discomfort persists until the injury is addressed. For the future of your running career, see a doctor and take the time to rehabilitate stress fractures, which requires a period of rest from running. Untreated, this type of fracture causes an increase in pain, decreased performance and injury complications, which can lead to more aggressive treatment options such as surgery. Tingling in your feet after a run can be as simple as swollen feet, which is the result of your increased activity. Swelling can compress the nerves that travel down your legs and cause a temporary tingling sensation in your feet. To reduce the swelling, have your feet rest on crushed ice for 10 to 15 minutes after a run. Another cause of tingling in your feet after a run is tight shoes. This is especially true for long distance runners because their shoes tighten due to swelling as they run. Avoid this type of discomfort by loosening your shoes early in the run to give yourself extra room for later. When buying shoes, keep a thumb's width between your longest toe and the front of the shoe. According to "The Everything Running Book" by Art Liberman, et al., optimize the shock absorption of your running shoes by changing them every four to six months, if you run approximately 20 miles a week.